does anyone take their straps out regularly for transport to allow the boards to stack better? i'm wondering if screwing straps back on regularly would chew out the plastic plugs? I did it for our road trip a cross the Nullabor but that doesn't happen very often. But as long as you don't over tighten or cross thread, it should be OK.
Velcro option would certainly save the plugs. Turn the screw anticlockwise until it clicks, then screw in. thx guys and thanks for the great tip Remery. i'm going to give it a go for a while and see what happens. i wonder why quick release straps have not been invented yet. My Tyronsea Wasp kids board in the 80's had quick release footstraps. They were one piece molded rubber with a neoprene cover. The ends were "T" shaped and fitted into 1/4 turn slots in the board. They worked great until I started jumping it and tore the tops of the T's off. I never take mine out ,just too lazy ...but the Dakine straps are soft and do press down ok .
^^^that's good thinking. Undo one end. I do this to keep them from being squashed in the bag, then when I need to put multiple boards on the roof rack I use straps threaded through a piece of noodle on each board so they are separated and can be taken off one at a time in strong wind without them blowing across the car park. If I'm ever putting 2 boards in a double boardbag I take off the straps on the bottom board as you can easily dint the top board if it's strapped down hard. tardy ill give the half screw a go. great idea. I do this one end. the half turn wrong way is a tip worth noting, I don't see any issue with the threads becoming crossed nor worn. I never fully remove screws in slot box or similar , threads are entirely different that foot-strap screws. I keep them on always, plus the straps act as cushion protectors for the deck covering 1/2 of the board. 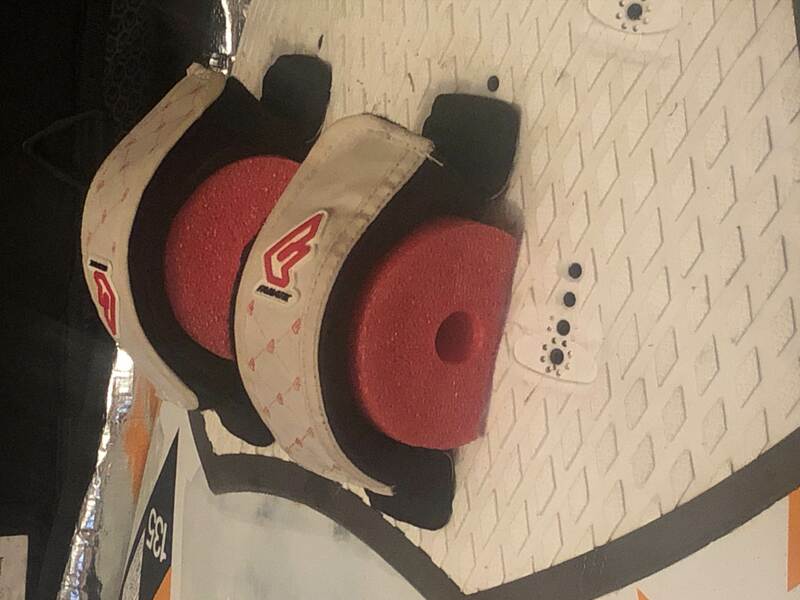 Then if something gets layed that's flat on top of your board, it's better protected, especially if you have the board in a board bag, more power to ya! And, if you lay your board upside down, 1/2 of the board will be in the air, since the foot straps are cushioning the board. Some great advantages there!! removing the straps is about trying to get less gaps between the boards so they stack smaller. once your putting a sup, 2 windsurfers and 2-3 surfboards on the roof the straps just take up way to much height. even lighter loads like 3 windsurfers on the roof the straps are the space of an extra boards. With that many boards being on top of one another and then anchoring them all down with rope or tie straps, I think you could arrive at your destination with cracked boards, or the fiber glass being compromised. If I had that many boards stacked up, I'd still keep the foot straps on all boards and put swimming pool noodles inside each board bag 3/4 to the front that will act as cushions as well that would match the diameter of the foot straps pretty close. When you anchore them down now, you have nice padding between boards. Plus when you anchore them down, it's going to smoosh the noodles and foot straps down a little, so that will eliminate some of the gaps between boards. I would put a noodle in the front and back of the surfboards and or SUP boards too, to keep them safe. Then strap everything down tight with no worries. I love using swimming pool noodles when I transport my board. They work great, do the job and are cheep to buy and last for years. 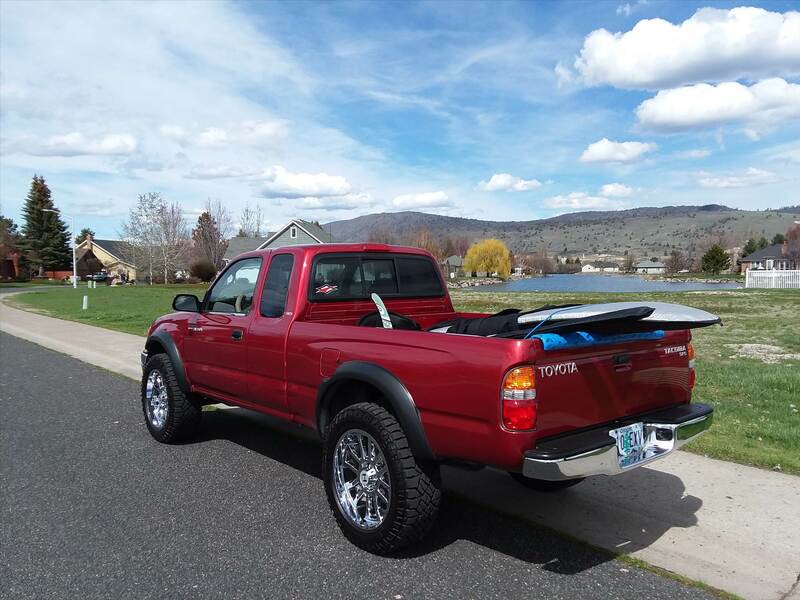 I just bring one board in my pick up truck and the board sticks out a little over the tailgait. So I cut a slit in the swimming pool noodle so it fits over the tailgait of my truck. It cushions the board when traveling, plus I can lay my 460 mast next to my board over the tailgait, protected and works like a charm. I'll take a pic of this setup and post it the next time I go out. ive never had issues with damaged boards from tie downs. i can understand tranasport in planes or trucks needing noodles like sean suggests but on the roof of car if your cracking boards then i can only guess the straps are too tight. That would just be my approach. I've had too many items in my life try to slip away when tied down, so I may use a little extra force to keep things from falling off the vehicle. Peace of mind if ya will. But with extra force comes more padding. I have my system, and it works like many others here. Pick the one that best suits you. Since you asked for advice, you're going to get many suggestions here. Just like I did with my harness lines question. Good luck! I ended up adding some painters tape to make the noodle longer lasting. So far 13 years on this 1 noodle. The rear footstrap keeps the board from getting scratched when I have the board bag off when I travel locally, and I rest the tail of the board up against the harness for more protection. All my other gear fits under the board. Very fast and easy to load. Now, that truck, is a Magic Ride. It's been a fun little restoration project. Still have some more to do to it. Considering a noodle at the dollar is a dollar. if the truck said Dodge Cummings Diesel , I would be in luv. It's pretty.